Republican Party presidential candidate John Kasich is an anti-White propagandist, who masks his hatred of the White Race behind a shroud of Christian Zionism. Like Mike Huckabee, Kasich has shamelessly participated in Fox News' incestuous relationship between mass media and politics, a stark conflict of interests once strongly condemned in Western Civilization. This consolidation of church, State and mass media behind the jewish agenda has done tremendous harm to America and the World. The same centralization of power serving jewish interests over that of the majority population occurred in the Soviet Union and continues in Russia under Vladimir Putin. Brazen hypocrite Kasich mistreated his guest Matt Hale in the following interview which aired on Fox News many years ago. Hale has since been denied his Constitutional rights to practice law and is currently imprisoned in the jewish gulag. America was founded as a sanctuary for the White Race. Our founding fathers recognized our fundamental rights to legal counsel of our choosing, not that of a jewish master, our right to freedom of and freedom from religion, and our rights of freedom of speech, association and assembly. 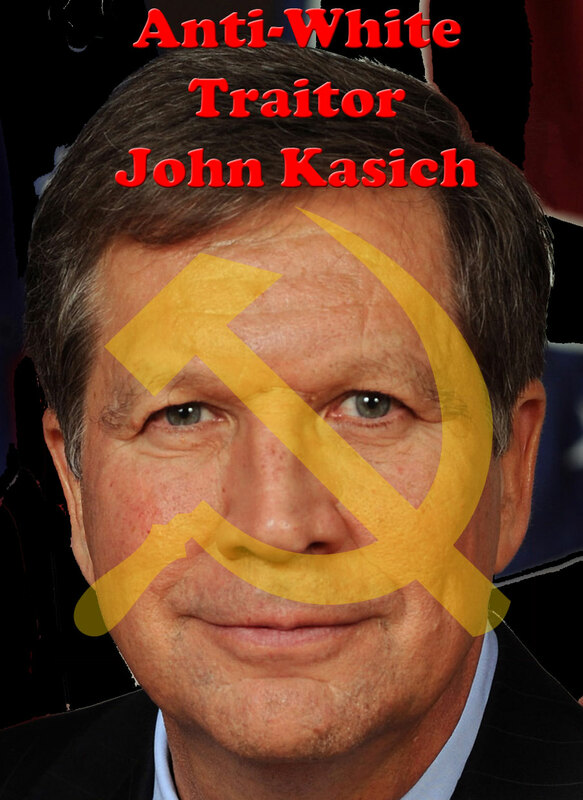 Kasich stands opposed to our freedoms and calls for the banishment of American patriots. He is a communist propagandist who wants the White Race dissolved out of existence. John Kasich is a racist zionist hypocrite, who, like Zangwill, wants the jews to have a segregated nation so as to preserve their race, while breeding out Whites in White nations. John Kasich wants to exterminate us in the US as he uses us as slaves and soldiers to serve jewish segregation in Israel.